I’ve reviewed the beef burger from the latest Wetherspoon Menu, with which they give you a burger with chips and a drink for only £5.10. I’ve only just realised that for £1.59 more, they give you a GOURMET variation of their cheap-o meal, and I couldn’t pass the opportunity over. The Veggie Burger is a great alternative to a hunk of mashed cow. Contrary to popular belief, humans CAN survive without a dead animal between their teeth three times a day. I was as surprised as you are! What surprised me more is the great feeling I get by not subconsciously thinking “I wonder what he thought before they electrocuted him”. I’ve been having more and more vegetarian meals since a couple of weeks, which may or may not have coincided with the arrival of our new Kenwood Food Processor and a variety of smoothies we made. Somehow I just don’t fancy meat anymore. Good! Stacked high on a soft bun (smaller than a DVD), there’s tomatoes, onions, a tiny bit of lettuce, a big flat mushroom (grilled to perfection), and a generous dollop of Levi Root’s Reggae Reggae Sauce – new to me as well, and not as spicy as I had expected. Very nice though. In between all this we find a patty made of puy lentils, sweet corn and cheese, in a batter. Really filling, and very nice indeed. We also find three of the (exactly) 6 onion rings I had missed at first glance. It’s all held together with a giant toothpick, served with chunky chips which – like on my last visit – could have benefitted from another couple of minutes in the deep fryer. It comes with a choice of alcoholic pint size drinks or coke/water/coffee/tea – ready in about 10 minutes. Goes to prove you CAN have a decent meal for much less than a tenner on the high street these days. Although not “the perfect dream burger”, this baby gets the highest remarks for value. £6.59 includes a pint of beer or cider, it’s delicious and filling – recommend it to your friends today. 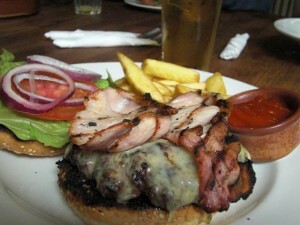 We’ve tried a similar meal in another Wetherspoon’s Pub in Wood Green, and the quality across the brand is consistent. 113 Thumbs Up from this reviewer! After such an amazing experience with my own home made burgers, I thought I’d give the Chiswick High Street ago and seek out the ultimate defender of the burger. They stopped counting once they had sold their billionth burger, they had countless re-designs of their stores and re-bradnings. They’ve never had a good review in their life and were under public scrutiny since 1982 – of course I’m talking about the one and only Mc Donald’s. 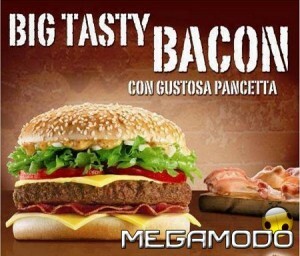 I’ve seen this particular candidate on their menu before, called The Big Tasty. Inevitably, I associate this burger with the taste of human flesh… there’s something about the special sauce that reminds me of when the German cannibalism trial was on (remember? Bloke answers an ad and wants to be eaten, then eats parts of himself with the other guy? Not funny!) – think that’s when the Big Tasty came to Britain. I ordered the one with bacon. It said “with bacon” on the box, and that’s certainly what I’ve paid my £5.29 for (that’s with soggy fries and a flat diet coke). Bacon would seriously have made a difference here – but it was not to be. 27 thumbs down for that to start the review. the burger itself. Bigger than the bun, fried well (at Micky Dee’s, they’re not grilled you know). There’s something about that beef taste though… I’m sure it’s not 100% as the advert claims. 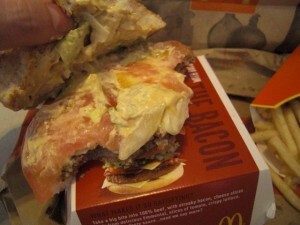 We also find some “special sauce” on this thing, a slice of tomato, some lettuce, cheese (preformed) and onions. It’s all like the advert describes, it just does’t look like it. When I ordered the “large meal”, I didn’t recall being asked if I wanted some chips with my salt either! 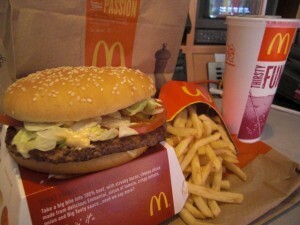 I did find some though: soggy, not sweaty, and with that typical Mc Donald’s fat taste once they cool down. You know, the one that sticks to your gums long after the meal is over. for the same amount of food, you sually have to shill out a lot more money. And when you do, you don’t get a headache later that day, like in this example (now we know what we pay extra for). My overall wellbeing after eating this was… well… not amazing. Sure I survived, and I’ve lived on an almost exclusive Mc Donald’s diet many moons ago – but it looks like over the years my body has developed senses for what’s good and what isn’t. This clearly isn’t! Do you see any damn bacon on this thing? This monster of a huge burger isn’t for the faint hearted. In fact, it’s for NOBODY. Do youself a favour and order the nuggets instead. 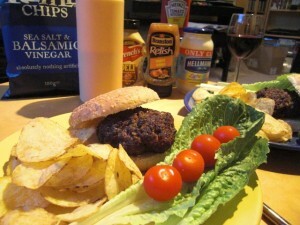 Home made burgers... 47 Thumbs Up! It was time for me to roll up my sleeves and see if I still had it in me. Why put everybody else to the test, when I can do these things myself? Ladies and gentlemen, get ready for MY OWN homemade burgers! Take the leanest steak mince you can find, say from Sainsbury’s. Have 500g (one pound) or a tad more. I recommend steak mince over ordinairy beef mince, especially over “half pork, half beef”, and that’s not because I’m scared of Swine Flue. Anything other than steak mince. The reason is that other minces will leak, and on the grill, smoke up the joint. Get some large soft fresh baps, preferrably with sesame on the top. Kingsmill do good ones, or instore bakeries at supermarkets. Stay away from the sort that’s been on your Off License’s shelf for the last decade, with a best before date next year. You’ve been warned! Now it’s time to shape the burgers. You do this best with warm hands. Take a good scoop and first make it into a ball, then flattening it evenly. Make sure no bits fall off, can easily happen if you’re using onions in your mixture. You want to check that the burger is about the size of your buns. If you decide to go ahead with anything other than steak mince, you will have to account for shrinkage too. Pork, lamb or “half and half” cheap-o-sucker stuff can shrink by up to 50% – seriously! For best results, grill your burgers for 15-20 minutes, turning them every 5-6 minutes. Use common sense here and don’t turn them over if they’re completely rare of course. On electric grills, do this at 180-200 C or gas mark 5 (god only knows what that is in Fahrenheit). If you want them raw (which you shouldn’t have), use a higher temperature to brown the outsides, and cook them shorter. You’re taking the risk of serious unwellness. If you cook your burgers too long (either because you’re paranoid, or just forgetful), you’re running the risk of a dry burger. That’s not nice, because you have to drown it in ketchup and mayo. You want them juice, but well done. use your imagination to decorate your plate, slap on all the condiments you can find in the fridge, grab a beer and enjoy! Serve them with chips, or open a packet of Kettle Chips like I do (stay away from Pringles if you can). Share your delight below, or even send a picture to burgers@versluis.com! On a spontaneous trip to meet Al Monty and JB, we checked out this very wine based gastropub in the centre of Verulamium, or better known as St. Albans. A decent burger, with plenty of oompf. They do the 8oz and 10oz version, with various toppings and in various styles. Bacon, Emmental Cheese, baby tomatoes, anything you could think of. This place could have been a burger bar in a different life. I opted for the 10oz version, which comes with chips, and is only £6.90 – which is a bargain compared to London prices. You get this with a pint of coke for under a tenner, which gives extra plus points right from the start. 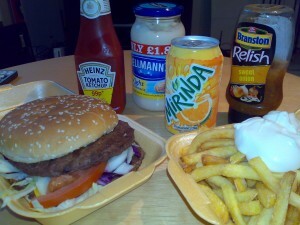 As for condiments you have Heinz squeezable mayonnaise (which was empty), mustard and Heinz ketchup from a glass bottle. But you also get a side dish of their famous “Bloody Mary Ketchup” in a little pot on the plate, which is great – a hint of Tabasco and a bit of something else make this one an unexpected dunkable delicacy. The burger itself is huge. Definitely the size of a DVD, with a grilled sesame bun. Mine was a bit burned, but the waiter exchanged it immediately for a nicer one. Full of meaty goodness I say, this home made burger stands out. Well done yet juicy, served with a huge slice of tomato and two slices of lean bacon. Bit of lettuce, and that was it. The chips were special too: thing cut, like fries rather than thick cut, with the skin on in places. These babies are not off the shelf and remind me of what you get at The Outback Steakhouse (but different… you get my drift). Verdict: it was so big that I couldn’t finish it. That’s a GOOD sign. It was juicy, it was tasy – it was the best! Up there in Burger Heaven, not even The Diner can touch it! Having received a raving review on the Beef Burger, I decided to give Deliverance another go. 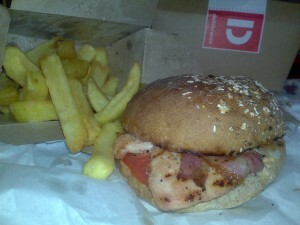 However, on the Chicken Burger, they couldn’t quite “deliver”. With the usual sweaty chips and all the ingredients you would expect from a good burger, this one came to the office luke warm. On top of all that, the top of the granary bun was rock solid hard. Not good, especially when we know they can do better. Considering £8.50 plus £2.50 chips, we’re all very disappointed… In their defence, I must admit having had this dish before, and it was definitely on to another winner. Bad luck in the kitchen, I guess you just can’t win the all. Sometimes, nothing says it better than a burger from a kebab shop. Enter the Seven Sisters Kebab and Pizza store. It’s been there forever, and although they were looking for a buyer not 12 months ago, the FOR SALE sign is gone for good and I understand in broken English that the proprietor is eager to keep the shop now. Which is good for us, because we only recently discovered that they do delivery. Hurra! When I came home today, after a hard day at IMG (in fact, testing the new P2 WordPress theme, in between jobs) I realised that I only had soup and a salad, so I came home rather hungry. 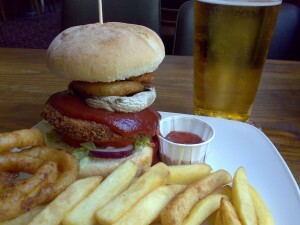 Why not try that Half Pounder with chips and a drink for a bargain price of £5? Deal! 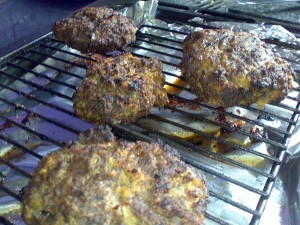 Burgers from kebab shops have something in common with burgers from greasy spoon cafes: the supplier. There appears to be only ONE distributor of these kinds of patties on a piece of paper, and they all taste the same. Sure, it’s all in the preparation, and you really don’t want to eat one of those (let alone two) when they’re fried. 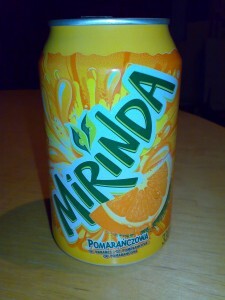 Mirinda - where have you been since 1979? As with all food you get here in Da Hood (don’t pronounce the “H”, enter “innit” or “aaaai” where appropriate), it’s grilled. 7 thumbs up for that already. But also, you get all the salad you’d expect from a good kebab. Add to that a good portion of fries, and I kid you not when I say: that’s more meat than you want to know about. Sauces include ketchup and mayo on demand, even chilli, garlic or burger sauce, but none of them are Heinz Deli Originals – so beware. The verdict: for the price of £5, including a can of your choice, and considering two patties on the burger, fresh salad and a nicely toasted sesame bun, you really can’t complain. Even if you know by heart that it’s essentially a cafe burger you’re getting, it’s well prepared. Speaking of the drink: I could hardly believe it when Mirinda caught my eye! Imported from Poland, made there by The Pepsi Co., it was the ideal addition to top this meal off. Somewhere in between Fanta, Tango and Orangina, that’s where Miranda fits in. I’ve missed you – you made my day! 9 Thumbs up for sure, maybe even 10. I should have realsied this much earlier than this week, but I have a confession to make: I love Burger and Chips. Any variation, any time, and place. So I thought maybe I’ll document my Burger and Chips journey thorughout the following months, with detailed pictures and descriptions where you can find the best burger in London (and in fact the world). Then of course there are The Diner and The Ice Wharf in Camden, all three with varying degrees of prices and quality. That’s what makes this spiritual and culinary journey so exciting.